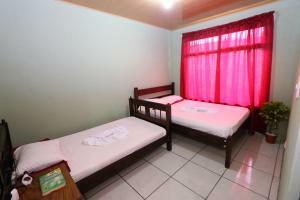 ﻿ Best Price on Monteverde Backpackers in Monteverde + Reviews! 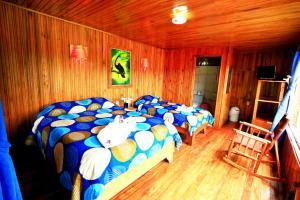 Located in Monteverde Costa Rica, Monteverde Backpackers provides free WiFi. Among the various facilities of this property are barbecue facilities and a terrace. The property is close to popular attractions like Monteverde Orchid Garden, Monteverde Ecological Sanctuary and Monteverde Butterfly Gardens. The rooms in the guesthouse are equipped with a TV. Each room includes a coffee machine and a private bathroom with a shower and free toiletries, while some rooms contain a kitchen. Guest rooms include a shared bathroom. Guests at Monteverde Backpackers can enjoy a continental breakfast. You can play darts at the accommodation. Sky Adventures Monteverde is 2.4 miles from Monteverde Backpackers, while Selvatura Adventure Park is 3.7 miles away. Dorms are not available for guest older that 40 years or younguer than 15 years old. Please contact the property in that case.